That is the most common question asked when introduced as a member of the Dodger front office. The answer? In my case, don’t hit the ball in Little League and you’re well on your way to a life filled with reference books, trading cards and anything else related to the sport and the hometown franchise. When I was in first grade, the local library staged a Saturday book fair and a classmate excitedly announced she had spotted a book that I probably would enjoy. Several minutes later, she returned with the prize: “The Los Angeles Dodgers, by Paul Zimmerman.” The book, published in 1960 on the heels of the Dodgers winning the 1959 World Series, featured biographical sketches of the players of the time (Gil Hodges, Duke Snider, John Roseboro, Don Drysdale) along with a section tracing the franchise roots in Brooklyn. I attended my first Dodger game at age seven on July 15, 1972. The Dodgers lost to the Montreal Expos, 3-2, and I watched with my family from the Field Box section – Aisle 44, Row M, Seat 1. That was nearly 40 years ago, and I still remember like it was yesterday, noticing the numbers change on the third-base auxiliary scoreboard and wondering why the persons in the next row were making pencil notations in the middle of their magazine. 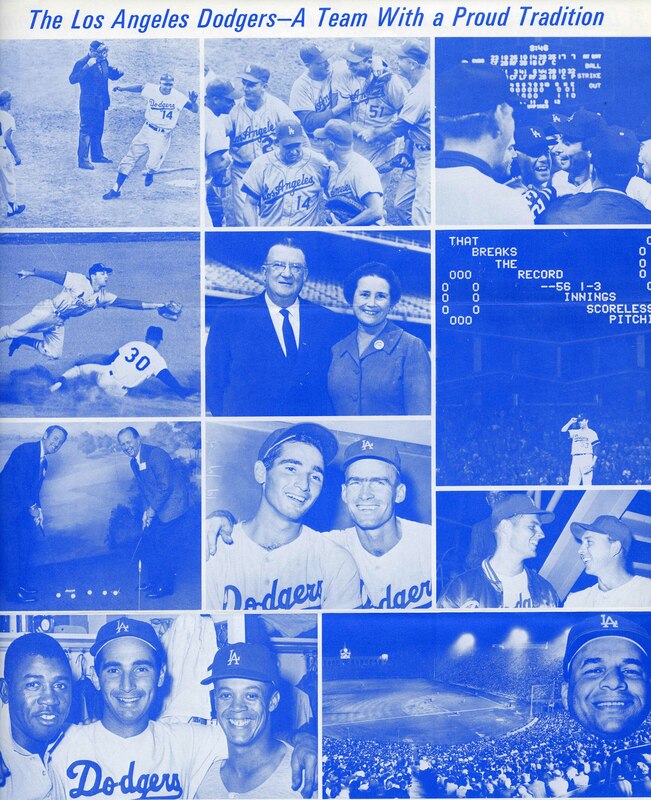 The goal for this Dodger History blog is to offer a variety of stories, mementos and other artifacts relating to the franchise history. The wins and losses run in cycles, but the memories remain for the fans and players, especially those alumni who were lucky enough to reach the Majors. The modern-day Dodgers wear blinders and can’t worry yet about their place in history. A big leaguer’s career can consist of 15 at-bats or 15 years, and trying to guess when it will end makes someone suddenly feel vulnerable in a sport that requires confidence for the moment at hand. There will be plenty of time later to reflect. a new generstion of fans is being born and wanted to.say thanks for the tickets so long ago…you might not even remember us baristas:) We always will remember you and your kind heart. Go Big Blue! I love the Dodgers history lesson. I also worked at Starbucks. Remember I was the Yankees fan, till our many talks brought me to love the Dodgers. Thanks for the conversations, tickets, souvenirs and great memories. We cheer the Dodgers on at Diamondback games in Arizona now. Go Dodgers! I just saw your piece during the Dodger game broadcast (09-12-12) regarding Elton John’s concerts at Dodger Stadium. You mentioned that no one else had ever worn a sequined Dodger uniform. Well, that’s not entirely true. I was at an Opening Day in the early 80s. While they were not nearly as famous as Elton John, sitting right next to me in the Loge section were two young ladies wearing Dodgers uniforms that were sequined from hat to shoes. Somehow they eventually made it to the field as a part of the Opening Day festivities, had several pictures taken with various notables and thereby had their 15 minutes of fame. This is great that you have made some Dodger fans.